We've written about Rich Internet Applications before, which attempt to mimic desktop applications inside a browser. On the other end of the usability spectrum, there are sites that attempt to mimic the command line prompt in a browser. The command line lets you execute, well, commands on your computer through text input instead of through the graphical user interface (GUI) like you're probably used to doing. The upside is that you can often do things faster by going through text than by clicking a button. Fundamentally, you can see a command line as a productivity tool. The downside is that you need to remember a fair number of commands to be able to use a command line efficiently, but you'll see that this isn't so hard. We'll focus on two sites that attempt to bring command line functionality to the web. Essentially, these sites let you access virtually any website you can think of through one command box. Say you want to find out the latest news about the iPhone. You'd enter something like "gnews iphone" without the quotes to search Google News for articles on the Apple iPhone. Or you want to find a video of Daniela Cicarelli on YouTube. Enter "yt daniela cicarelli" without quotes as always. If you're bored, there are also commands available like "simpsons", which brings up random quotes from The Simpsons, or even "random", which generates a random number for you. The best part is that you can contribute new commands. If you've come up with a great timesaver of a command and can't wait to share it, you can create it here. A full list of commands is available here. 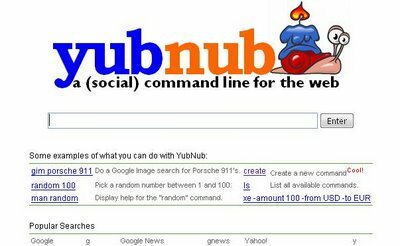 If you become addicted to the speed of using YubNub, there's a Firefox search plugin as well as integrations for IE7, IE6, Safari, Opera, and other browsers. Sugarcodes: This is a new site that mimics YubNub in functionality. The commands are a little different, but most of the popular ones are the same. "yt" still lets you search YouTube, but Wikipedia search is now "wiki" not "wp". As before, you can contribute your own "usercodes" to Sugarcodes. On the downside, there's no way to integrate Sugarcodes into your browser. Which URL command line should you use? It depends on which one you feel more comfortable with. Although the basic commands are the same, Sugarcodes, for instance, might have more specialized commands that you find useful, or maybe the commands are just plain shorter. 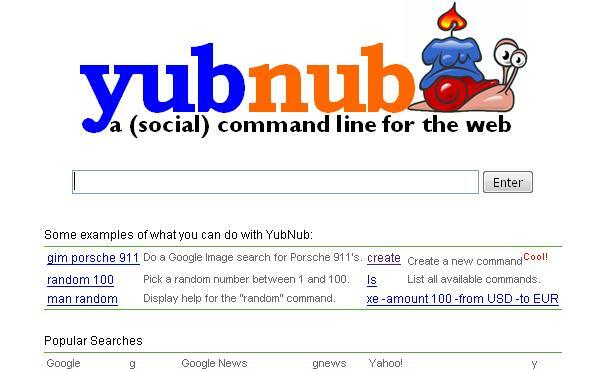 One thing in YubNub's favor is that you can add it to your browser's search bar, which makes it vastly more convenient. Dozomo: A lesser known command line for the web. The commands are a little on the long side. For instance, you need to type "google" to conduct a Google search instead of just "g". There's browser integration available as well. Firefox Add to Search Bar extension: Right click in any text box and select Add to Search Bar to add a new search engine to your search bar. Sidekiq: Not a command line, but emulates its comprehensive nature. Just enter a search term and click on different links to search different sites. In some cases, it's actually more efficient than using something like YubNub.